30/07/09 – Acquisition – Montréal, Musée des Beaux-Arts – Another Italian Renaissance painting has just entered the collections at this Canadian museum, a little over a year after the one included in the Horstein donation (see news item of 17/4/08). 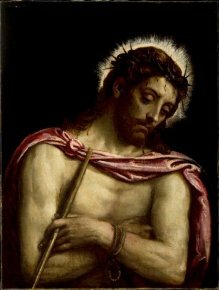 This one is a Christ Crowned with Thorns by Veronese, acquired from the Galerie Maison d’art in Monaco and the first work by this artist to join the Montreal museum . The canvas  can be dated to around 1585. Hilliard T. Goldfarb, curator of old masters at the Museum of Montreal, is correct in associating this figure of Christ with Titian’s various “Ecce Homo” painted in the 1560’s, notably those at the National Gallery in Ireland and in the Duke of Northumberlant’s collection at Alwick Castle. Veronese uses the same composition and imparts the same feeling of resignation on Christ’s face as the ones of his predecessor. This type of Christ, seen from the waist up, with a crown of thorns and holding a reed seems unique in Veronese’s work but was to be taken up quite frequently during the Italian Seicento. Strictly speaking, this does not fall under the theme of Ecce Homo which usually depicts Pontius Pilate at His side showing the Savior to the crowd, nor is it that of The Crowning with Thorns as here Christ is already wearing this attribute. The title of Christ Crowned with Thorns chosen by the Museum of Montreal is thus more appropriate, although Christ with a Reed is also used often. Of the three great Venetian artists of the mid-16th century, the Musée des Beaux-Arts only owned a painting by Tintoretto, Portrait of a Member of the Foscari Family and no drawings or paintings by Titian. Cf. Terisio Pignatti et Filippo Pedrocco, Veronese, Catalogo completo, Florence, Cantini, 1991, pp. 316-317, n° 248.